The Gargoyle Warrior (アックススタチュー, Akkusu Sutachū?, lit. 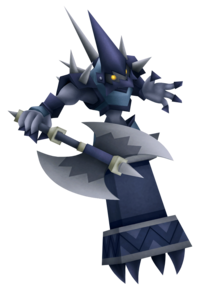 "Axe Statue") is a Pureblood Heartless that is found in Kingdom Hearts II. It is actually an ordinary statue being controlled by a Possessor Heartless. It attacks by spinning around with its axe. They ambush Sora and friends when they come near. A Gargoyle Warrior is a statue with a tall, rectangular pedestal colored in various shades of dark grey. It has four steel grey spikes in its base. The statue itself is that of a muscular, wingless gargoyle with light grey skin and dark grey claws. The gargoyle wears heavy armor colored in shades of blue and grey. The armor also sports several tall, silver spikes. The gargoyle's face is dark grey, its eyes are yellow, and it wears a conical, steel blue helmet. It also wears steel blue gauntlets on each of its wrists. The Gargoyle Warrior carries a large, double-headed axe with a grey and silver blade, a steel blue handle with several pale yellow rings decorating it, and a silver spike on both ends of the handle. The Gargoyle Knight's name refers to the creature the statue is meant to resemble. "Warrior" may refer to its armored appearance and its use of a heavy axe as a weapon, contrasting with the Gargoyle Knight. Its Japanese name, "Axe Statue", is an obvious reference to its status as a possessed statue, as well as its weapon of choice.